The Federal Transit Administration awarded Community Transit $43 million to build a bus-rapid transit line from Everett to Bothell. It’s the first of eight Washington transit projects that were threatened by President Donald Trump to secure funding under the new federal budget. Community Transit in Snohomish County has secured $43 million in federal funding to build a new bus line connecting Bothell with Mill Creek, South Everett and Paine Field. The 12.5-mile Swift 2 route will feature 13 new buses running every 10 minutes during peak hours. The route will have 3.6 miles of bus-only lanes, traffic lights that give buses priority and a new transit center across from Boeing’s main gate in Everett. It’s expected to carry about 4,000 riders a day when it opens in summer 2019. The project is one of eight across the state whose federal funding has been up in the air since President Donald Trump proposed slashing transit grants in both his 2018 and 2019 budgets. But those requested cuts were essentially ignored by Congress, which passed a budget last month that increased funding for bus and rail infrastructure, allocating about $2.6 billion for major grants across the country. “Snohomish County commuters just got a shot in the arm,” said Sen. Maria Cantwell, D-Wash., who announced the new funding along with Sen. Patty Murray, D-Wash. The federal funding will pay for about 60 percent of the new $74 million bus line, with local and state funds filling in the rest. Construction on the project is already underway. Officials at seven other transit projects in Washington — most notably Sound Transit’s Lynnwood Link light-rail extension — remain hopeful that they will receive grant money under the same Federal Transit Administration (FTA) program that funded the Swift 2 bus route. Six of those projects are in the Puget Sound region: Lynnwood Link, light rail from Angle Lake to Federal Way, the downtown Seattle streetcar, the Tacoma Link streetcar and RapidRide bus routes in Seattle on Madison Street and through Eastlake. Sound Transit has applied for $1.2 billion in FTA money for Lynnwood Link, an 8.5-mile line from Northgate to Lynnwood whose projected costs have risen to $3.1 billion. She said the agency hoped to have funding agreements with the FTA for Lynnwood this summer and for Federal Way sometime next year. One potential note of optimism for Lynnwood Link and the other Puget Sound-region projects: The FTA thinks more highly of all of them than it does the Snohomish bus line, which it just funded. 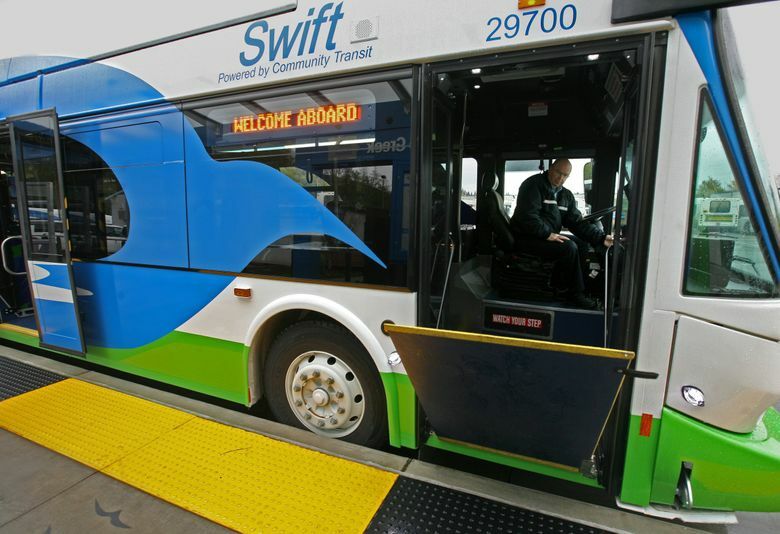 The Swift 2 project was rated “medium” by FTA, based on factors like how much local money was committed to the project, land use and potential ridership.